Alex MacLellan joined the Blue Sky team as an investment researcher, working on portfolio analytics, VC and start-up technology research, and discovering investment opportunities. Alex also assists in helping with Blue Sky technology, including web site development. 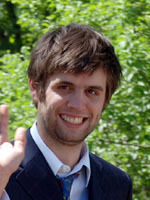 Alex graduated from Hampshire College in 2012. At Hampshire he completed an amazing project on the history of the book, including a large research paper and three artist’s books. Alex is artistic, creative, and has a strong sense of visual design that he brings to his Blue Sky work. Alex also has extensive experience in educational settings (Gaining Ground, Mass Audubon, Drumlin Farm, The Meeting School) and small scale farming (Gaining Ground, Linden Tree Farm, Hampshire College, Cricket Creek Farm). This included several years experience in organic farming including growing produce, large and small animal care, milking, farm equipment operations, and field maintenance.